While using Windows computers, you go through different drive partitions on which your files are saved. Generally, C drive is assigned to the operating system on which all the system programs and files are saved. Remaining other partitions like D, E, etc. are not used by operating system to save any system files, as these are left for user to store their data., On one hand where these drive partitions are visible to the users, Windows operating systems from Windows 7 to 10 also have a drive partition which is hidden and no drive letter is assigned to it. It means we cannot find it using Windows Explorer. This partition is named as ‘System Reserved’. 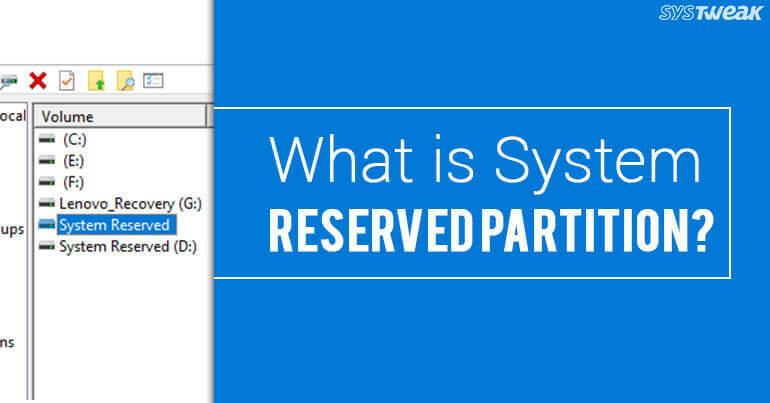 Let’s get to know more about this hidden System Reserved partition. As the name suggests, System Reserved drive is a reserved partition in the hard disk which is created during fresh installation of Windows 7, 8 and 10. Basically, this partition is used to store Boot Manager and Boot Configuration Data, so that whenever a computer starts, Boot Manager reads the boot information from Boot Configuration Data, which in turn results in start of Windows from system drive. Additionally, System Reserved partition holds the space for system startup files which can be used for drive encryption using Bitlocker. So, whenever you need to encrypt your hard drive using Bitlocker drive encryption feature, then it is the System Reserved partition which contains all the necessary files to start it. Right click on Start menu icon and click on Disk Management. (Or Go to Run and type Diskmgmt.msc). In the new window, you will see the list of partitions available on your system, also you can easily locate System Reserved partition in the list. What If You Delete System Reserved Partition? It is not advisable to delete this partition, as it contains the boot loader files which are required by Windows to boot properly. It means that Windows will fail to boot if you delete this partition. Also, it does not hold much space on the hard disk, therefore there is no reason to delete it. Windows hides this drive by default instead of showing it in Windows Explorer by creating its drive letter. However, if you still do not wish to have this partition on your computer due to any reasons, then it would be better to prevent it from being created during fresh Windows installation. System Reserved partition is created for Windows which is very beneficial and not unnecessarily occupying space on your hard drive.